Recently I won a prize over on Seasons of Lace and the goodies from Crimson Orchid arrived this week! Below are three stitch marker sets, each with it’s own ring to keep them organized when not in use. The largest ring is a Row Counter Bracelet – it’s really fun! Each of the two coils has ten beads. Designate which is for ones, which for tens, and as you finish knitting a row the appropriate bead is slid through the little glass bead cluster (strung with elastic). As Chris said, it’s a knitting abacus! 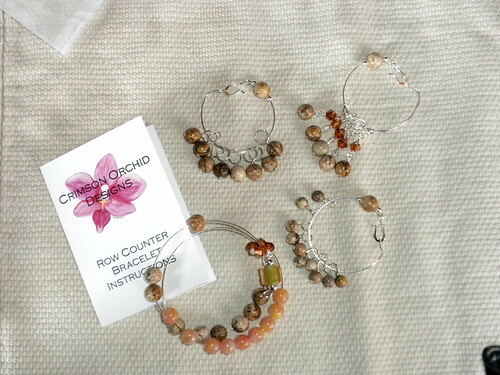 All of these little gems (actually they’re Jasper) are from Crimson Orchid Designs. Aren’t they fun? Don’t you need them too? Shipping was fast and the prices are really reasonable. Go shop – have some fun – and keep your knitting organized!